Based on the Hockey Canada/CRFC arena census done in 2005 – 1,857 arenas supplied us with building dates and at that time 45% of Canada’s rinks were already beyond their projected life expectancy. There has not been a recent study of this caliber to update these numbers. The largest construction boom in Canada occurred throughout the 1970’s with 756 arenas built in the early 1970’s. Of 1,857 arenas that supplied construction dates 1,350 arenas were constructed before 1980; this translates to 47% of arenas being over 26 years of age. 594 arenas were constructed before 1960; this translates into 32% of arenas being over 36 years old. The oldest arena was constructed in 1921. 65% of ice arenas use ammonia as the primary refrigerant, 25% use freon as the primary refrigerant and 10% have natural ice. Primary heating fuels are natural gas with electricity being the second largest. 134 respondents indicated they had planned major renovations to their refrigeration system of $50,000 or more. 74% plan renovations between 2006 and 2008, 14% plan renovations between 2009 and 2012, 5% plan renovations between 2013 and 2015 and 7% plan renovations after 2015. The value of these renovations nationally is in excess of $335,000,000. 169 respondents indicated they had planned major renovations to the building of $100,000 to in excess of several million dollars. 48% plan renovations in 2006, 21% plan renovations in 2007, 15% plan renovations in 2008, 4% plan renovations in 2009 and 12% plan renovations beyond 2010. The value of these planned renovations nationally is in excess of $530,000,000. WorksafeBC has a full and comprehensive PDF on all aspects of managing ammonia refrigeration system and is quite possibly one of the best reference pdf’s widely available in Canada referencing Canadian Legislation. Australia has a very well developed ammonia control infrastructure. Here are some resources that offer great value from down under. This is a very well documented and in-depth resource which is backed and supported by many key organizations. 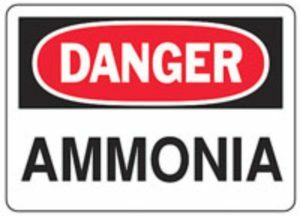 Read more about ammonia safety in order to equip yourself with the knowledge to protect your business. Make sure you abide by refrigeration compliance audit procedures. Be sure to follow proper ammonia compliance. Don’t toy with safety!